Espresso, matcha, yerba mate, hot cocoa...even some soaps and lotions contain caffeine! We encounter the stuff every day, and as a society, we love it. But how much caffeine is too much? For starters, why do we even need to moderate caffeine? What's the big deal? Caffeine is a highly addictive substance, like sugar or cocaine, according to studies by many institutions. It doesn't take a lot to develop a dependence. How many folks do you know who "can't function" without their morning cup of coffee? The science behind the hook is simple. Caffeine can disguise itself as adenosine, the molecule in our bodies that makes us feel tires, and take its place. This not only delays our feeling of tiredness, but also spikes our adrenaline and dopamine production, making us feel rad and happy and ready for action. When the caffeine wears off, our exhaustion catches up with us hard. We get cranky, tired, sore and headachey. Know what the easiest fix for this bad feeling is? That's right, more caffeine. It's super effective! What's the downside? Why not just stay on the ride? Put simply, the human body needs rest. If we just go and go and go, we will eventually cease to function. Lack of rest leads to a weakened immune system, mental fuzziness, lack of appetite moderation and improper regulation of blood sugar. Not to mention caffeine directly acts as a cardiac stimulant and vasodilator, which means it ups your heart rate and lowers blood pressure. Neither is necessarily a bad thing, but without moderation can become dangerous. The current view taken by the medical research community is that up to 400mg is pretty safe for the average, healthy adult. If you're pregnant or caffeine-sensitive, cut that number in half. 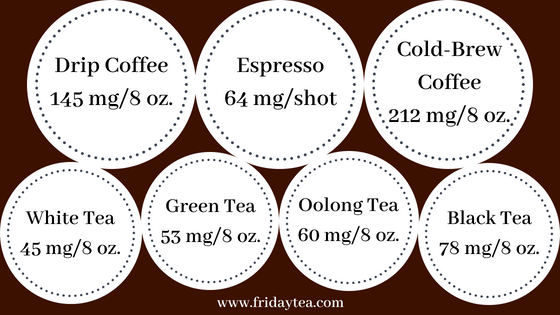 Let's look at the caffeine present in our favorite beverages. To stay below 400mg. caffeine daily, pick one. Of course these are averages, and only of a few of the many many sources of caffeine. Different teas and coffees (and chocolates, sodas, medications, etc.) will net different concentrations of caffeine per cup. Specific to tea, a second steeping of your leaves will result in a cup containing a mere 20-30% as much caffeine as the first infusion. Every infusion of the same leaves decreases the concentration of caffeine, so after two or three steepings, you're essentially drinking a decaf tea. Oolong fans, drink away! Another factor to pay attention to is the half-life of caffeine in your body. How long will you feel the buzz? How much of a break do you need once you hit that 400mg (or 200mg) line? Studies have shown that caffeine has a half-life of about 5-6 hours. This means if you drink that 145mg at 8am, you still have 72.5mg in your bloodstream at 1pm. Popular opinion is to cut off caffeine by 2pm to make sure you've wound down enough by bedtime. To sum up today's lesson: while caffeine can be a super useful tool for perking up your mind and getting your blood pumping, moderation is key. Unless you are pregnant, elderly, a small child or have a cardiac condition, chances are you're safe consuming up to 400mg daily. Try to avoid caffeine in the afternoon and evening if you want to get a good night's sleep, and if you start to experience any of the above warning signs, maybe it's time to back off your intake a bit. On that note, I'm off to enjoy a morning cup of tea. I hope you found this informative! Please comment with questions and/or comments. Much love!